Below, you may find the steps of obtaining annual working visa in Russia. Every year, until the pre-determined month of the year, the quota application should be submitted to the Labor Placement Office (Центр Занятости Населения = Employment Centre) for the year following. For example, assume that you will be employing a foreigner in your company in the year of 2020. For the position of this foreigner, until the pre-determined month of the year of 2019 at latest, you are required to submit an application; otherwise, you may not even start the employment procedures for the year of 2020. The application to Labor Placement Office (Центр Занятости Населения = Employment Centre) for the position to be employed should be made at least 30 calendar days before the application to Foreign Workforce Work Permit (ИРС = Work Permit) and it is required that, until the date on which Foreign Workforce Work Permit (ИРС = Work Permit) is obtained, once in every 15 days, the application for these positions should be renewed either via informing the Labor Placement Office (Центр Занятости Населения = Employment Centre) via fax or personal visit. Obtaining of Permission for Employment of Foreign Labor Force in the name of the Company or in other words, application to Permission for Employment of Foreign Labor Force (ИРС = Work Permit) in the name of the company can only be made 30 calendar days after the application to Labor Placement Office (Центр Занятости Населения = Employment Centre) is submitted and after the application to Foreign Workforce Work Permit, it is required to wait for 30 calendars more. In a more clear statement, obtaining of Foreign Workforce Work Permit (ИРС = Work Permit) in the name of the company, in total, is the sum of Labor Placement Office (Центр Занятости Населения = Employment Centre) and Foreign Workforce Work Permit (ИРС = Work Permit) processes and it is 60 calendar days. 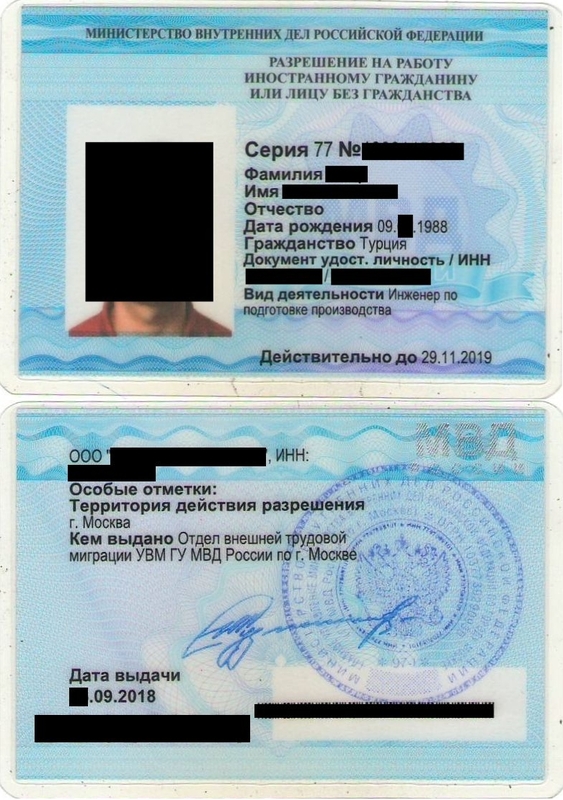 The application for the invitation that is required for obtaining the work visa can be made just after the application for the work permit (Разрешение на работу = Personal Work Permit-Plastic Card) for the individual is completed and within 7-10 calendar days, this invitation will be issued for a period of 3 months with single entry and exit. Currently in Russia, for those individuals who are residing with the work permit, if the same company continues to apply for work permit, there will not be an invitation necessity. With the single entry invitation that is issued by referring to employment authorization card and that is valid for a period of 3 months, in any one of the Russian consulate general, single entry visa with 3 months duration will be obtained and once the individual enters the Russian Federation, this single entry visa with 3 months of duration will be converted to multiple entry visa. Completion of this procedure takes 14-21 calendar days. If in the current situation, the individual is residing in the Russian Federation with a work visa, once the plastic card is issued, the process of extension to multiple entry-exit visa will start, and at the end of 14-21 calendar days, the visa will be extended up to the duration of the Plastic Card. In order to be able to obtain the invitation for the visa, conduct of the visa extension procedure and completion of migration register, it is required that the company is registered at the Directorate of Federal Migration District Office (UVM). Declaration to UVM (Federal Immigrant Services Management): Declaration with respect to employment. Within 3 days after which they sign their work contracts, the employer will be required to complete the procedures for the foreigners who are employed within the Federation of Russia, as set forth by the laws of Russia, and the same obligation is valid for the cease of employment as well. Within 3 days following the cancellation of the work contact, it is required to notify Federal Immigrant Services Management. With the purpose of being clearer, we present the list of documents that are required for obtaining work permit below, in Russian.